Location: Apple Tree Cottage, Main Street, Ganton. 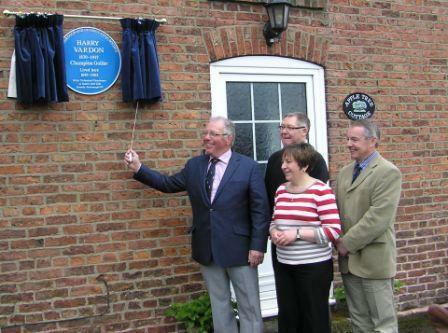 Plaque unveiled on 9th May 2015, the 145th anniversary of his birth. Henry William (Harry) Vardon was born on 9th May 1870 in Grouville, Jersey, a small village on the eastern side of the island. In 1878 the Jersey Golf Club was formed nearby and Harry, along with other local boys, spent school holidays caddying and playing golf using home-made clubs and balls discarded by golfers. After leaving school at the age of twelve he eventually found employment as a gardener. However, his brother, Tom, a successful golf professional, suggested he move to England and in 1890 he obtained a position as greenkeeper at Studley Royal Golf Club near Ripon and subsequently at a course at Bury, Lancashire. Harry Vardon worked very hard to improve his game, practising constantly after work and experimenting with various clubs and grips. In 1893 he and his brother Tom entered the Open Championship at Prestwick, coming 23rd equal and 28thequal respectively. 1896 was to be a significant year for Harry Vardon. He heard that a club near Scarborough required a Professional/Greenkeeper. Ganton golf course had only been founded in 1891 but he accepted the position and set up home with his wife in a rented cottage in Ganton. In this year a match between professionals from Yorkshire and Hampshire was staged, Harry Vardon from Ganton versus John Henry Taylor from the Royal Winchester Golf Club, which Vardon won handsomely. Taylor subsequently wrote, ‘Little did I guess when playing Harry at Ganton that I was playing a man who was to make golfing history and develop into - what is my solemn and considered judgement - the finest and most finished golfer the game has ever produced’. A month later he went on to win the Open at Muirfield after a play-off against Taylor. His reputation was made and he went on to win two more Opens whilst at Ganton, Prestwick in 1898 and Royal St George’s at Sandwich in 1899. There is a full account of Harry Vardon’s illustrious golfing career in ‘The History of Ganton Golf Club 1891 – 2006’ by Douglas Ian McKinnon, published in 2006. In 1900 after a successful tour of the United States he won the US Open at Wheaton, Chicago, Illinois, beating his old rival J H Taylor. This made him the first player in the history of golf to win both Open Championships. ‘Vardon was a kindly and considerate man of great courage. His name will live in golf annals. Not only was he the supreme player of his time but he was a catalyst to the development of golf in America and his methods are a link between the style of the early players and the modern approach.’ Harry Vardon died in 1937 and is buried in the churchyard close to the South Herts Golf Club.